Tamarindo is one of the most visited towns in Guanacaste. It is very popular for its beautiful beaches, excellent surfing spots, boutique stores, nightclubs, yoga studios, schools, and all the different possibilities for lodging! Tamarindo has a lot of variety of foods with more than 100 restaurants. The City is truly a mix of different cultures and thus this cultural diversity is reflected in the food as well. 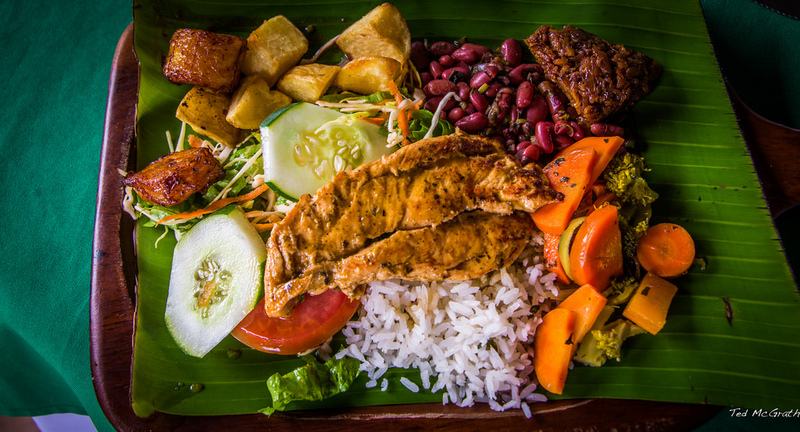 Local dishes are less expensive and worth a try, Gallo Pinto (rice and beans) is the traditional breakfast, Casado is the main dish for lunch, Ceviche and Coconut water are served fresh along the beach and town. Here you will find some places that are well known for its unique services. A beachfront restaurant located right next to the Tamarindo estuary. It is secluded from the center of town so you will be able to enjoy a peaceful meal right next to the ocean. If you are looking for a romantic dinner the place is elegantly decorated and illuminated by the moon. It is also perfect for large groups with a variety of dishes including fresh seafood, meats, pasta, salads, as well as vegan and vegetarian options. The place is always a good choice for watching the sunset with a cocktail and an appetizer. This restaurant/beach club is merged with Las Mareas Villas which are private luxury villas with full access to Pangas, located right across the street. In their Facebook page, you’ll find a weekly calendar with the schedule and announcements of the activities they host. Pangas Beach Club is also an amazing venue for private events like weddings. Conveniently located in the center of town, Wok and Roll is one of town’s favorite Asian restaurant. With a unique fusion of Korean, Thai, Vietnam, Japanese and Mongolian food this is a top choice for most locals. You will find remarkable dishes and flavors in this popular restaurant. They have an oyster bar with fresh and tender oysters and a sushi bar. It’s a family restaurant with choices for everyone, Wok and Roll even offers a children’s menu. The place is nicely decorated, with a modern Asian twist that makes this place one of the most visited one in the main strip. The sushi rolls here are one of the most acclaimed in Tamarindo! An organic store and cafeteria, ideal for breakfast or a quick healthy lunch. It is a small boutique with few tables that serve fresh ingredients and homemade food, mainly recommended for small groups. You will find baked goods like brownies, banana bread, cookies, carrot chia muffins, bread, and more ready to go or to sit and enjoy while drinking a local coffee. Do not miss the seared tuna-mango-avocado tacos on homemade tortillas, the most acclaimed dish of this restaurant! In the store, you can buy organic and artisans goods like energy bars, coconut oil, honey, and kombucha which are all prepared in La Bodega. Vegetarian and vegan options are also available in their menu. In this beautiful cafeteria, you’ll be able to eat healthy but delicious! One of the most popular restaurants in Tamarindo. This BBQ and Grill is located right across Tamarindo beach, in a corner of the main strip. A beautiful place to enjoy an Argentinean wine and a fine dinner with family and friends. They serve imported meat cuts but and also have vegetarian options, seafood, pasta, and pizza. We highly recommend making a reservation before going since they tend to have high demand. Our recommendation: Meat empanadas!